The Hybrid Carbon M/Speed (Moderate Speed) blade provides excellent playing features thanks to CFL Technology as well as a maximum of controlled power combined with extraordinary ball control. Hybrid Carbon M/Speed is the perfect balance of speed, weight and flexibility. Experience more power and spin for topspins and smashes and great feel and control in short balls and passive blocking. Enjoy a wide range of new opportunities you may have never thought possible. Hybrid Carbon M/Speed opens up a whole new material dimension: Powerful, straight topspin play without annoying vibration. More power and precision in each stroke When playing at moderate bat and ball speed, you will enjoy a new experience of power, forgivingness and precision. This special feeling will inevitably take your attacks to a new level of success. 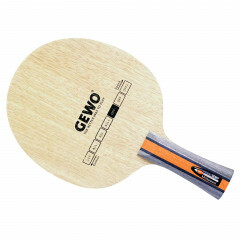 Gewo Blade Hybrid Carbon M/Speed Off- is beeing added to cart.